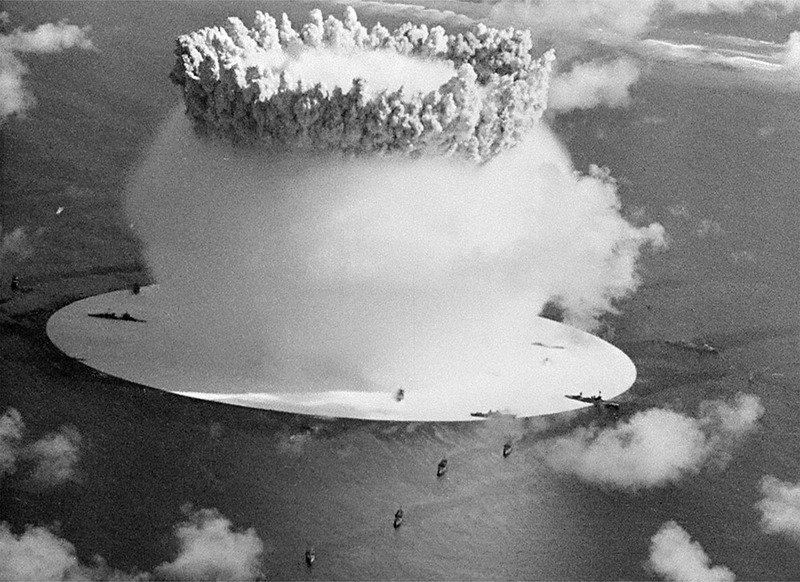 "Crossroads" (1975) Edited from declassified footage, Conner has fashioned a film masterpiece illuminating the first underwater atomic bomb test at Bikini atoll on July 25, 1946 as both fact and symbol of our age. The atomic detonation in the centre of 95 Japanese and United States warships is seen as an event in itself, as theatre, as sculpture, time, clouds, mist. "Looking for Mushrooms" (1967) is a dream of searching for magic mushrooms filmed in San Pedro Tenancingo, Mexico and San Francisco. Thousands of single-frame shots are combined with multiple exposures to create a dazzling array of semi-abstract images. An experimental tour-de-force edited in camera. The American artist and filmmaker Bruce Conner (1933-2008) is one of the avant-gardists of the Underground film scene of the late 1950s and 1960s. His experimental films that both capture reality with poor technical means and aestheticise it in a rather unique lyrical way, are considered as pioneers of MTV-Clips. By chopping archival footage into collage-sized bits he changes the whole language of cinema and Underground filmmaking.